Children have access to technology from an early age and while this can help to prepare them for the future, it may also expose them to inappropriate content. Parents who don’t want to stop their kids from owning a mobile phone, but who want to make sure that they are safe while they access internet can rely on spy apps like iKeyMonitor. With this technology, you will be able to keep track of what your kids do online. iKeyMonitor is easy to use and it supports the main features needed to protect your children from the dangers that lurk on the internet. It is also an effective solution for employers who need to keep an eye on their staff to ensure that they use work phones for personal purposes and that they don’t share confidential data of their company. iKeyMonitor can be installed within minutes and it is compatible with Android and iOS, the most popular mobile platforms available at the moment. There is a version that doesn’t require jailbreak, if you prefer not to carry out this process on your iPhone or iPad. The app works in stealth mode, meaning that it won’t be detected by the target users. After the installation, there is no visible trace of the app on the device. This discreet performance is preferred by parents and it allows them to get more accurate results. iKeyMonitor offers a wide range of monitoring solutions, but we will focus on the Mobile Spy Keylogger, which focuses on smartphones and tablets. This software is capable of logging keystrokes, passwords, URLs visited, messages, GPS location and more. There is a free trial that allows you to test the service for 24 hours. 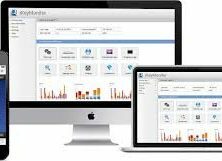 One month of the online monitoring solution that allows you to access all the information logged from your web account costs $44.99. If you extend the subscription to 3 months, the monthly cost is reduced to $37.49 and if you pay in advance for one year, the price per month will be just $22.49. With iKeyMonitor Online you will also be able to update your license remotely. This means that you can change to a different version of iKeyMonitor or extend your subscription from your online account. It is also possible to turn the app off or on, from the control panel and configure the settings without having physical access to the device you are monitoring. The Online solution gives you access to the data from any device, as you just need to sign into your online account. You can also opt for iKeyMonitor STD, which send logs via email/FTP. While this option doesn’t allow remote configuration and the option to access the logs online, it is cheaper than iKeyMonitor Online. One month costs $29.99, the monthly price when you pay in advance for three months is $22.49 and if you extend the subscription to a full year, the price per month is reduced to $11.25. The app is designed for parents who need to check what their kids do online and for business owners who need to monitor their employees’ work devices. iKeyMonitor supports the functionality that will allow you to monitor all the activities on the target device. The features supported cover the applications and online services that are more likely to be used. You will be able to monitor, track and record information effectively. Here is more of what you can do with iKeyMonitor Keylogger. Texts and Calls – iKeyMonitor tracks all the text messages sent and received, and it also lets you see details of all outgoing and incoming calls. Notes, Reminders and Memos – Get access to events, notes, reminders, notes and more. Calendar – With iKey Monitor Mobile Spy Keylogger, you will also be able to view date and time of the events entered in the calendar. Address book – iKeyMonitor shows you information from the address book so you can see contacts on the target phone and their respective details. Emails – Check the content of the emails sent and received, as well as their time stamps. Chats – You will also be able to access conversations on popular messaging apps an social media sites. Options like WhatsApp, Facebook Messenger, Skype and Viber are supported. Since these apps are widely used, it is important to check them and with iKeyMonitor you will be able to make sure that your kids or employees are not engaging in inappropriate conversations. Voice messages – It is also possible to get records of the voice messages on apps like Viber, WhatsApp, LINE, Wechat and QQ. GPS location – Get accurate details of the location of the target user. The keylogger will track the GPS location and will show it on the virtual map. Keystrokes and passwords – Thanks to the keylogger function you will be able to keep track of the keystrokes and text pasted. This will allow you to track the passwords typed on the device that you are monitoring. Browser history – iKeyMonitor also lets you see what websites have been visited, regardless of the browser used. iKeyMonitor covers the main features needed to ensure that you know what your children are doing online. It is easy to use and to install and the Online version allows you to configure the app remotely and check the logs online. The app works on stealth mode and it offers good performance overall.